Again this year, Ebb & Flow invites you to join one of our open choir workshops followed by public concerts. We are currently creating a lot of new video content for you to enjoy. Check it out! We really would love to stay in touch with you - also on social media. Do us a favor and follow or subscribe to our pages. Click the icons below and join our family! Thanks! 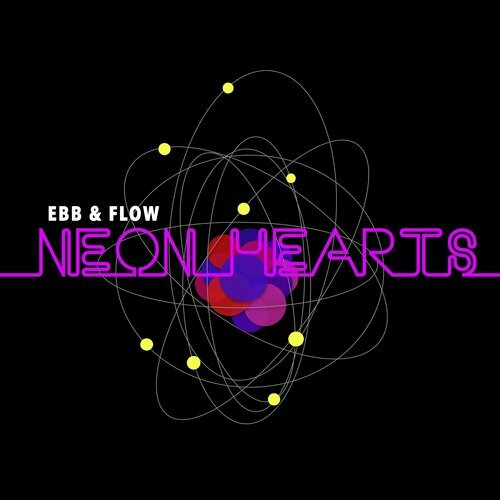 Ebb & Flow is a soulful pop trio, originally founded in Los Angeles, consisting of Gabby Gordon (vocals/keys), Ronen Gordon (drums/laptop), and Morten Kjær (vocals/keys). The Danish-American-Israeli band began working together in 2014. They have since toured on three continents and released two studio albums: "Neon Hearts" and "Edge Of The World". Growing up, Gabby Gordon and her family lived in Denmark, Switzerland, Czech Republic, England, Germany, and the US. Her unique life experience has inspired her love for music and her songwriting. Today, Gabby performs regularly at high-end venues in LA and does co-writes and recording sessions. On her latest solo album, she collaborated with the acclaimed Nashville producer Marshall Altman. Born and raised in Jerusalem, Israel, Ebb & Flow's drummer and producer Ronen Gordon is particularly active on the American prog rock scene where he tours with the bands LoFi Resistance and Sound of Contact. He is also a sought-after freelance session and live musician on the LA music scene as well as an award-winning drum instructor at the renowned Musicians' Institute in Hollywood. 27/4: Viby Gymnasium & HF, Denmark - POSTPONED until 22/9!! Journalist Heather Allen from "Music Connection" attended Ebb & Flow's February live show at The Hotel Cafe. "... Los Angeles indie pop/soul trio Ebb & Flow is not your average local act. Their latest album Edge of the World does a great job using their preferred musical elements and distinctive vocal personalities to shift between the band’s soft, tender side and their rambunctious, angsty side, which makes for a compelling dynamic. Soulful, seductive harmonies paired with trance-like keys and synthy percussion make it easy to get lost in the band’s music, while also understanding where the tracks’ lyrical themes originated. ... This funky trio showcases strong versatility in their work with the potential to appeal to a range of listeners and markets." Do you have a big house, great garden, or cozy barn? Or do you have connections to theaters, clubs, festivals, galleries, or other interesting locations that could create the framework for a special concert event with Ebb & Flow? Our band loves both the intimate spaces and the larger settings. Our goal is to give our listeners unique musical experiences, and we are accustomed to collaborating with hosts everywhere. Please send us an email, if you have an idea. We would love to hear from you! Join us at one of our open choir workshops in Denmark or Germany this year! Vocal harmonies play a BIG role in both Ebb & Flow's live concerts and on our albums. Our passion for the human voice has resulted in the making of a a series of choral arrangements of songs from Ebb & Flow's repertoire. We use this material at workshops followed by public concerts in varies cities across Europe and the United States. Some of our arrangements have been collected in a songbook that is available in our post-show merchandise booth. The charts have five parts (SSATB) + solos. Whether or not you are a member of an existing choir or vocal group, or you just like to sing in the car or shower, YOU are invited to join Ebb & Flow's workshop and concert in a city close to you. 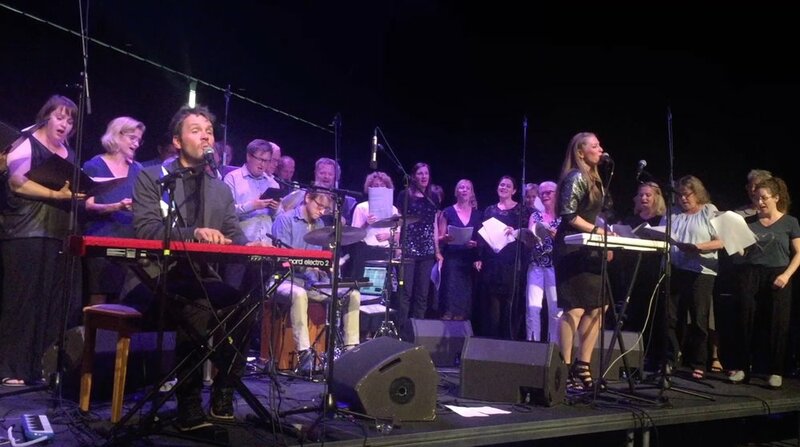 At this event, seasoned choral director Morten Kier will guide all participants through the vocal arrangements, and fellow band members Gabby and Ronen Gordon will intersect with vocal exercises, phrasing techniques, and rhythm grooves. We aim to create a space where everyone can sing, feel inspired, be challenged and make some musical friends. Material and audio files will be sent out in advance so that all singers have an opportunity to study the music at home or with their own choir leader beforehand. This will allow time to also do fun warm-ups and other “fun stuff” during the Ebb & Flow workshop. Ability to read music is not a requirement for participation, and everyone is welcome! The Ebb & Flow concerts will sometimes take place immediately after the workshop and sometimes on a separate date. The show typically consists of two sets of 45 minutes, and twice, the workshop choir will be invited on stage to perform the prepared songs. The concerts are often open to the public, and tickets can be purchased online (ticket links are announced here on the site) as well as at the door. Prices for participation in a workshop & concert is 25,- €, or 20,- € for students / groups of 10 or more. When a workshop is offered, tickets can be purchased in the SHOP here on the site. Also, check out this VIDEO. ... is Ebb & Flow's latest album, officially released in 2018. The album has 9 tracks: "Polaroids", "+1", "Dancing (On The Grave Of My Dreams)", "Touchstone", "Behind Enemy Line", "Silver Tongue"; "Fury", "One-Track Mind", and "Edge Of The World". All songs were written and produced by Ebb & Flow and mixed + mastered by Christopher Given Harrison. Listen to a small sample of the title track on the MEDIA page. ... is Ebb & Flow's first album released in 2016. It contains 9 tracks: "Neon Hearts", "Love In The Raw", "Second Skin", "Back To Start", "Power". "Only You", "Help Me Through The Night", "Smoke", and "No Pretender". All songs were written by Ebb & Flow, and the tracks were recorded and produced in California by Ronen Gordon, Morten Kjær, and Christopher Given Harrison, who also mastered the album. LISTEN to the songs and watch a LIVE VIDEO. Listen to & purchase the music on ITUNES and SPOTIFY.